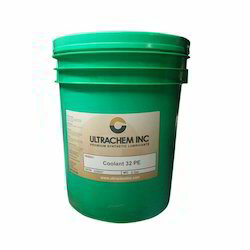 Offering you a complete choice of products which include ultrachem coolants (pag/ester). These are the original polyglycol (PAG)/diester blends developed to replace Sullube® 32 and l/R Ultracoolant® respectively. In use for over fifteen years, these coolants work very well with an 8000 hour life in good operating conditions. Applications of high humidity, heat, or other adverse conditions may result in shorter life.Coolant 32 PE, Ultrachem Coolant PE, Ultrachem Coolant PE 68 : Developed recently, after the expiration of the patent on Sullube 32 and l/R Ultracoolant, these products utilize a Polyol (PE) ester with a unique PAG and additive system designed to replicate the original products. The PE oils offer life comparable to the Sullube 32 and IR Ultracoolant and should be used for higher temperature operations or adverse conditions.